some more little previews of some jewelry i’ve been working on for the beehive bazaar next week! i still have lots more to share… so i hope you don’t get sick of looking at my newest creations. i’ve just been eat, drinking, and sleeping jewelry lately..
again. i hope to get these on my website soon. please email/comment on anything specific you may want right away..
and p.s. i’d love to know your opinion. i usually don’t list a ton of my jewelry in my etsy shop, [just sale items and one of a kinds] but, are you more inclined to buy from a private site or an etsy shop? in my experience etsy is just too saturated with jewelry so you have to charge nothing in order to get high volumes of sales… plus they charge fees. and, honestly i’ve had good luck on my own website. Let us know when you post some in your shop…I am really liking some of your new designs (in that first pic specifically!) Cute stuff. oh my! These are so beautiful! I love the colors. 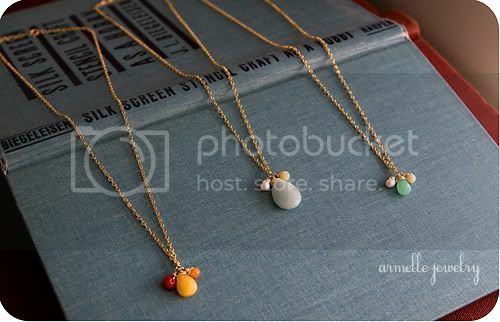 What is the price for the green and yellow necklace in the top picture? I am interested in having you put that in your etsy shop. i love them! really pretty and fresh! etsy is easiest for me, but i get what you’re saying about all the other jewelry shops!! Very pretty- I’ll be coming to get a gold one! After all these years, it’ll be my first time going to the BB. I’m mor inclined to browse etsy, it’s more fun to browse. BUT, if you’re name is established enough I think having your own site is more beneficial and professional. Maybe try both for a while to bring the etsy customers to your site? hi, can’t remember how i found your blog but i’m so glad i did. it’s lovely, as are your new pieces of jewelry! love them! and i use etsy all the time, it’s just more convenient and easy. I shop both at independent sites and at Etsy. As long as I can use Paypal, I don’t have to reenter my shipping info every time, so it’s basically equally easy. I guess the advantage to Etsy is that people are more familiar with it and might feel more comfortable. Everything is lovely, by the way! 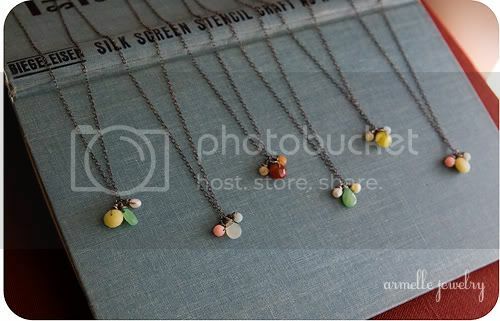 I’m in love with the red,orange, and yellow necklace! love it! love the stones + color combo. hope they’re available in your shop too! j’adore vos B.O elles sont superbes, si fines, bravo.